Sammich lovers rejoice! In December 2017, Subway announced the return of the $5 footlong. Subway originally launched the $5 footlong back in 2007. The deal was championed with a catchy nationwide advertising campaign and quickly became a huge success. During the “Great Recession” years from 2008 – 2010, as consumers cut back on spending, it was difficult to find a better deal than the $5 footlong. The $5 footlong concept was originally conceived by Miami, FL-based Subway franchisee Stuart Frankel. Frankel introduced the $5 footlong in 2004 after his weekend sales began to slump. Sales shot up immediately afterwards and it was clear that Frankel was onto something big. Frankel spread the gospel of the $5 footlong, but it took 3 years for Subway corporate to latch onto the idea. The $5 footlong helped Subway re-ignite its slowing growth in the face of increased competition. The $5 footlong has faded in recent years. The price was raised to $6 at some restaurants a few years go, but many Subway franchisees have abandoned the deal altogether. In December, I visited a Subway in my hometown of Johnson City, TN and ordered a Spicy Italian sub. I was shocked when the cashier rung me up and said “that’ll be $8.75, sir.” It seemed like a rotten deal, particularly given the less-than-fresh ingredients I saw display. This anecdote may very well explain why Subway has been struggling in recent years. Let’s take a visual look at Subway’s recent decline. Since the “slow fade” of the $5 footlong, Subway has lost ground versus it’s competitors. Subway saw its store count grow about 800 net openings per year from 2008 – 10 with the success of the $5 footlong. There was a brief contraction in 2011 (likely a delayed response to the recession), but store count growth skyrocketed over the next two years, with a record 2,368 new openings in 2013. That rapid growth turned to rapid decline by 2016. A net of 34 restaurants were opened in 2015, while 2016 saw the net closure of 355 Subway restaurants. Subway’s contraction contrasts with many competing sandwich chains which saw strong growth into 2015 and 2016. Firehouse Subs, Jersey Mike’s, Jimmy John’s, Potbelly, and Which Wich continue to rapidly expand, making life more difficult for Subway franchisees. From 2011 to 2016, Firehouse Subs, Jersey Mike’s, and Which Wich have more than doubled their store counts, while Jimmy John’s and Potbelly have also seen spectacular growth. It’s clear that Subway franchisees are facing increasing competitive pressures from other chains, as well as from other Subway franchisees. 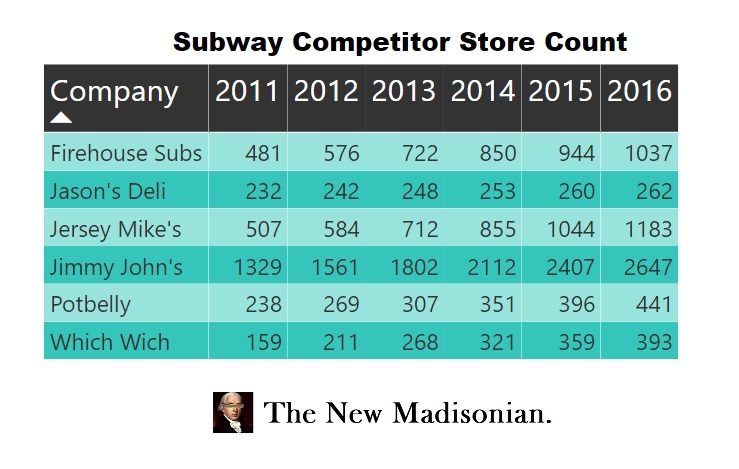 Given the rapid store count growth of its competitors, it should come as no surprise that Subway has lost significant market share since 2011, as well. Among our group of 7 sandwich chains, Subway controlled a massive 84% of the market in 2011. While Subway is still by far the “Big Kahuna” of the group, its respective share had fallen down to 71% by 2016, with Jimmy John’s and Jersey Mike’s doing the most damage. Where Has Subway Struggled the Most? Subway’s growth has not been universally poor, but it’s struggling in more places than not. First off, let’s take a look at the 2-Yr store count growth back in 2013. The chart below analyzes every state in the US. 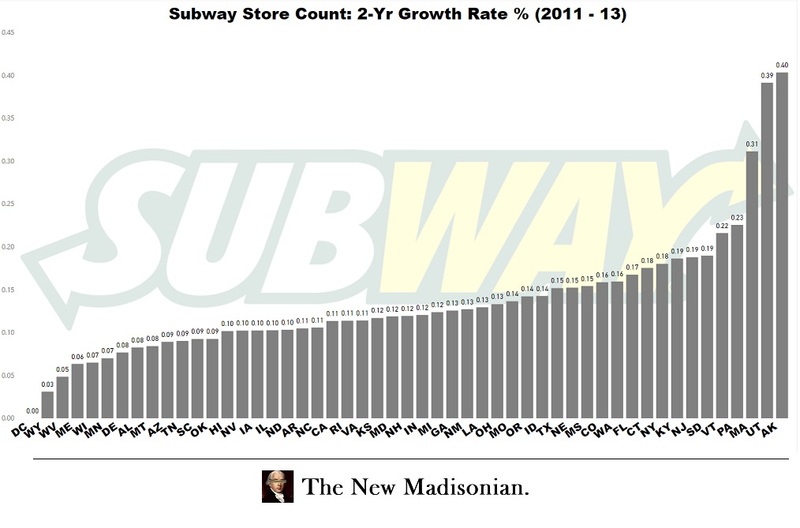 Subway had significant growth everywhere except for DC. If we look at the same metric in 2016, we see very different results. Subway saw declines in about half of its markets. We can see this visually with Tableau. 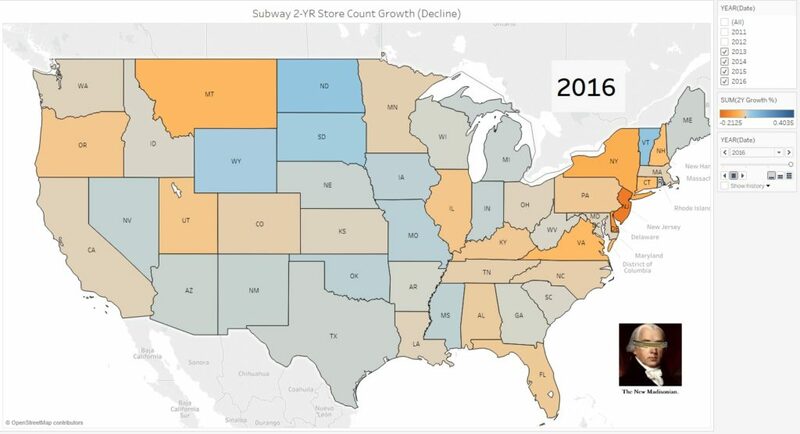 The chart below shows states with the biggest Subway store count gains (blue) and declines (orange / red). In New Jersey, Subway saw a decline of over 12% of its store count. It also fared very poorly in New York, Delaware, Virginia, Connecticut, and Montana. There were a few bright spots for Subway. Vermont, North Dakota, South Dakota, and Wyoming saw growth. Vermont is the odd-ball, but the other areas where Subway saw store count growth are mostly rural states adding jobs due to the oil / gas industry. Subway is still succeeding in these smaller markets. It appears that the large, saturated markets with heavy competition are where Subway’s true struggles lie. The reason behind the declining store count can be seen more clearly by examining the average revenues per store. In order to calculate this, we examined Subway’s Franchise Disclosure Documents and made estimates based on franchise fees and weighted average store counts. Since these are estimates, we expect that our numbers are slightly off, but that the overall trend is accurately portrayed. 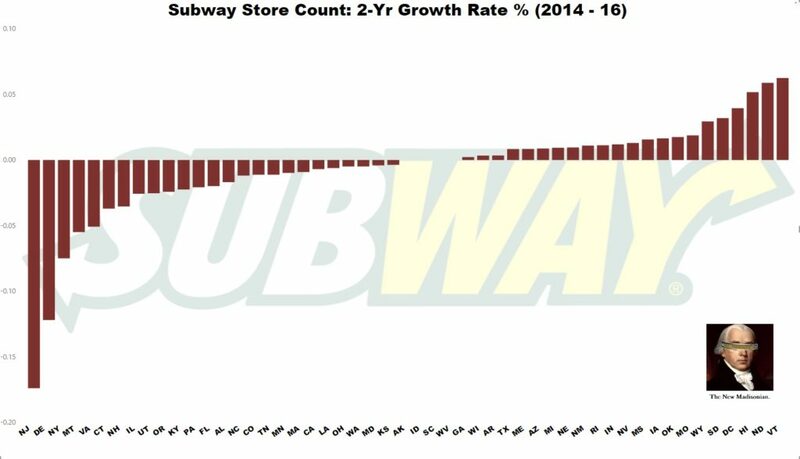 Based on our estimates, Subway’s average revenue per store was about $520,000 in 2009 and rose to $613,000 by 2012, before beginning a dramatic decline. By 2016, we’re estimating revenues had fallen all the way to $442,000 on a per store basis, a 28% decline from the 2012 peak. 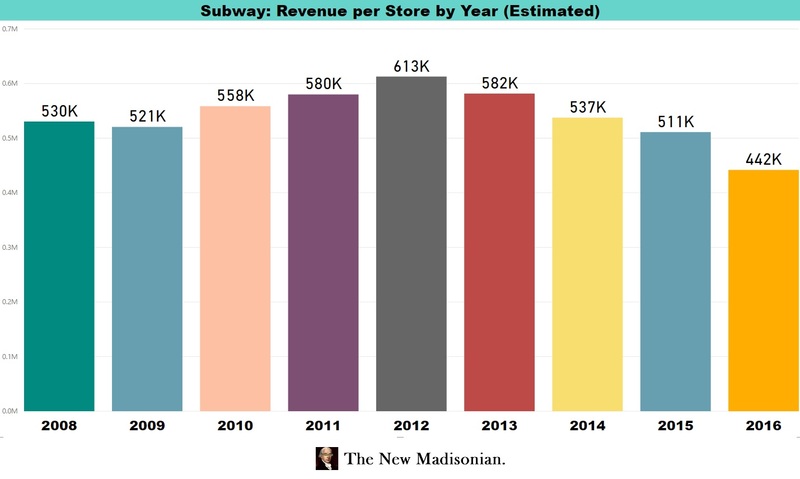 We can also see how Subway’s system-wide revenues have evolved during this timeframe. Similar to revenue per store, these figures are estimates, but the overall trend should be accurate. In 2009, Subway’s system-wide revenues in the US were $12 billion. That improved all the way to 2013, when revenues peaked at $15.6 billion. In the 3 years after that peak, Subway saw a decline to $11.8 billion, or about 25% off the peak. 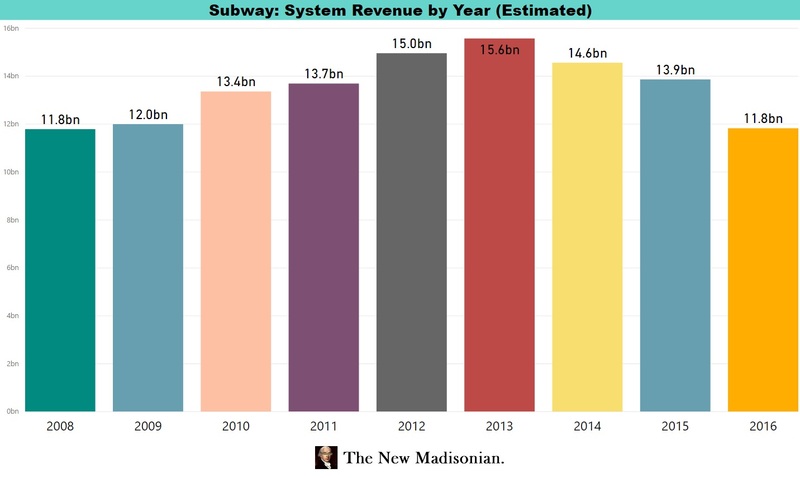 It’s worth nothing that this would also mean that Subway’s system-wide revenues are back around 2008 – 9 levels. 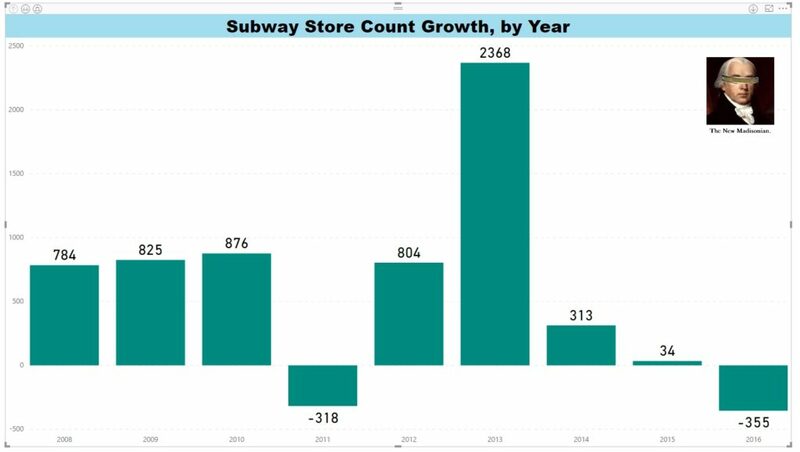 From these charts, we get a better understanding of why Subway has seen declining store count. Indeed, since most franchisees will hang on with losses for awhile before taking drastic steps such as shutting down stores, we can see from the revenue per store figures that the decline is even worse than it might appear based on store count data. Declining growth explains the revival of the $5 footlong. It’s difficult for Subway to compete with the “better sandwiches” chains on quality. They have to differentiate on price. It’s understandable that the franchisees don’t want to cut prices while struggling so much over the past few years, but realistically speaking, much of that “foot traffic” is never coming back unless Subway has a more competitive offering. Subway cannot be the ‘lower-quality chain’ that charges the same higher-prices as the “better sub” chains. It has to either go more upscale or provide better value and the latter is an easier fix. All hail the return of the $5 footlong!